The sultry summer has passed, but the stress from everyday life and work can still wear on you. Sometimes you just need to get away, but that’s hard to do without taking vacation days. So, many people just lie on the couch after work and waste time. 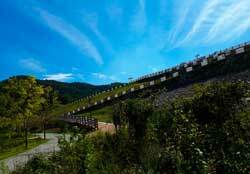 But if you have the motivation to drive a little or hop on a train, the Geumosan Reservoir and Olle is a great place to unwind and enjoy nature at its finest. And you don’t need to make a lot of travel arrangements or do any packing. This is the perfect day trip! If you are driving, slow down and enjoy the scenery! Some tourists drive so fast up the mountain that they miss the entrance to the Geumo Province Park. There are two parking lots on the mountain. When you ask a taxi driver to take you at Geumosan, he will most likely take you to the parking lot in the middle of mountain. So, before you get to the mountain, you need to speak up and tell him to go to ‘Geumosan Daejuchajang’ (big parking lot) next to the Geumochen stream. Then you can slowly walk up to the mountain and enjoy more scenery. If you drive slowly and take in the scenery, you won’t miss the sign leading you to the parking area. If you’re taking a train (make sure you look out the window and take in all the beauty), get off at Gumi Station and grab a taxi to parking area. It’ll cost you about 3,600 won each way. Note: It takes more than two hours to get there by car from Camp Humphreys and Osan Air Base. By train, it’s about 20 minutes less. If you don’t feel like taking a cab, you can reach the entrance to the Geumo Province Park in 10 minutes on foot from the station. When you walk down the street, you’ll notice the tiled roof of traditional-style building. This building is a museum dedicated to the people of the Joseon era (1392-1897). Further down the street you will run into three or four hipster and classy-style coffee shops near the entrance of the parking lot. I know some folks really need their coffee, so here’s some good places to enjoy some. Once you arrive at the entrance, you’ll see a path zig-zagging it’s way to toward the reservoir Olle Gil. The railing along the uphill path has traditional paintings and calligraphy mounted on it, so the art critic in you can critique and enjoy the painting and drawings at your own pace. Once you get to the end of path, you will set your eyes on the beautiful reservoir. You can just stop right there take it all in as a breeze washes over your skin and refreshes you. The Olle Gil is a path that surrounds a large portion of the reservoir. The path is about 2.4 kilometers long and connects to the Gumi Eco Park. There’s so much to see. After walking the path and seeing all the strange rock formations and bizarre stones along Mt. Geumo, you just might feel like walking path two or three more times. Part of the path is a floating bridge, which is lit up at night with LED lights. It’s really beautiful and some people come just at night to enjoy view. It is easy to find turtles resting on rocks near bridge and fish jumping out of the water. The bridge is a favorite place for children. The entire path along the Geumosan Reservoir is a great place to walk and take pictures. Large trees line up along path and there are plenty of benches and pavilion where you can rest and take it all in. Although it is a single path, you can see new things on every step. It takes less than 40 minutes to complete the path, but you can take as much time as you want, and it’s a great place to have a picnic with family, friends or that special someone. At the end of the Olle, you will see a beautiful building named Chaemi-jeong. The scholar Gil Jae, who lived during the turbulent transition period of Goryeo Dynasty (918-1392), escaped Seoul for the countryside because he would not serve for another king of a new dynasty. Although he wasn’t wealthy, he refused to take the new Joseon Dynasty’s high official position and he barely managed to stay alive, existing on herbs, roots and tree bark. Thus, his home was named Chae Mi (Chae Mi means herbs)-jeong. From Chaemi-jeong, you can hear the sound of a stream running under the bridge leading to a shrine. In the summer, people crowd under the bridge to avoid the hot weather and play in the water. If you enter the Chaemi-jeong, you can see the architecture of a Hanok (traditional Korean-style house), and try to imagine the conviction this scholar had. Train from Waegwan station to Gumi station.